You Can Tell Us What You Need! 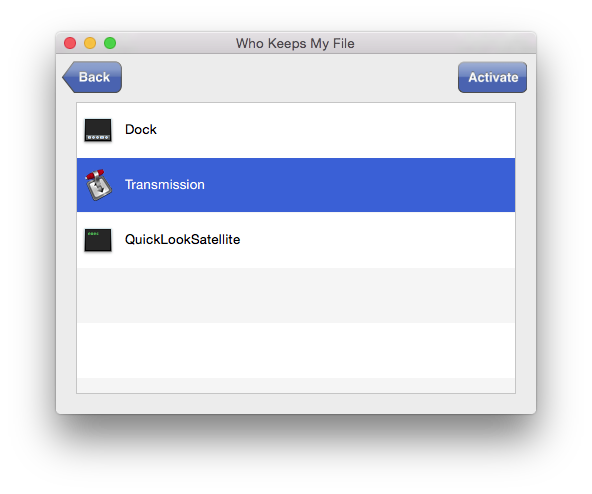 Who Keeps My File is a small utility that lets you find which programs keep files open and prevent you from emptying Trash or ejecting an external drive. 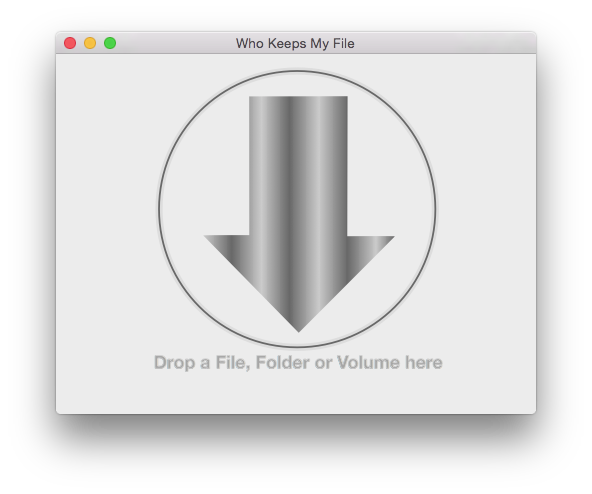 Who Keeps My File is a small and handy application that helps you find which apps or system processes keep files open and prevent you from emptying Trash, ejecting an external drive, modifying files, etc. or place the needed Terminal command to the clipboard (and use it then for force quitting a background process). As you run Who Keeps My File, it displays an application window with a drop area. When you want to check a file or folder to see what's blocking it from further operations, just drop it from Finder to this application window. Note:Another way is to select the file or folder via the application's main menu using the File>Open… command. In the search results list, you can select an application and click "Activate" to bring it to the foreground. Press ⌘C to copy the program's name to easily find it in the Activity Monitor, or ⇧⌘C to copy a Unix 'kill' command (in the Terminal, you can paste it to force quit that process). For any questions in addition to what is covered in this Online User's Guide, or for any technical support requests, you are welcome to email or contact us via our support page. You are always welcome to contact us with your comments and opinions regarding this application. If you find this utility helpful and would like to help others benefit from its capabilities, too, you're welcome to rate it on a software review site such as MacUpdate, or just share a link to this page on your favorite social media channels. Thank you for using the Who Keeps My File utility, and welcome to check out more of our products designed to be helpful for your productivity!